If you're looking to get away from the hustle of Charleston, Edisto Island is a photogenic and relaxed community within an hour of the city. It's not commercialized and not heavily trafficked as is Hilton Head Island. I visited both areas in April during a brief jaunt to the South. 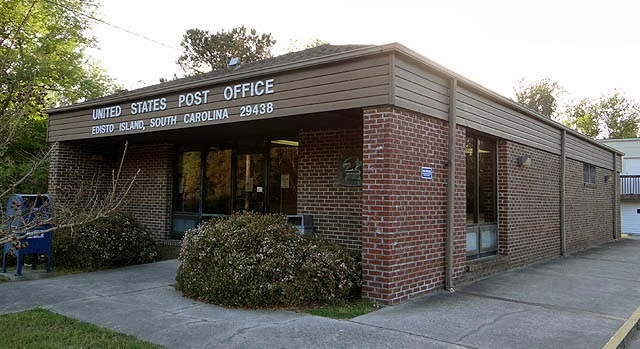 Of course my mission on Edisto was to photograph the post office, which lies 17 miles down from its nearest, and smaller, (and not to mention highly photogenic) neighbor in Adams Run. The present post office building, a mid-'80s model, is a rather standard structure. The former post office site, however, which I first noticed as a seemingly extraneous dot on the Google Maps app on my phone, is definitely worth a look. It's now the Old Post Office Restaurant, and they've got the old postal window to prove it! But first, a photo of the location. Here's a general map of the area. 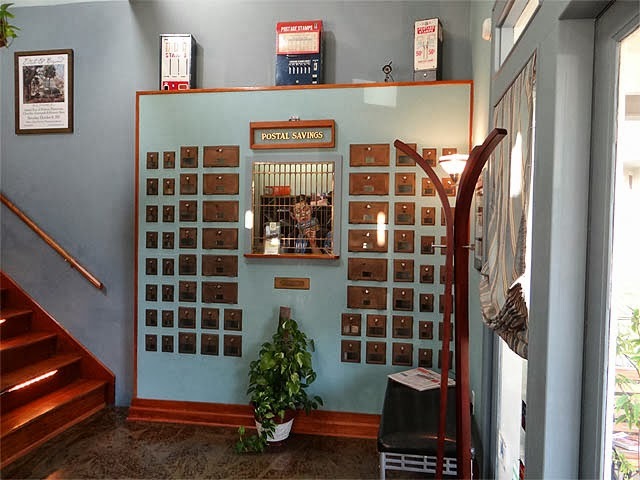 The present post office has been occupied by USPS since June 1985, and its current lease is for $18,500 per year -- $13.21 per interior square foot. The present Old Post Office Restaurant is the second such institution to reside at this location. The first O.P.O. Restaurant opened in 1988, three years after the post office moved out. It closed in 2006, but not after having received press coverage in such publications as USA Today and Gourmet Magazine. 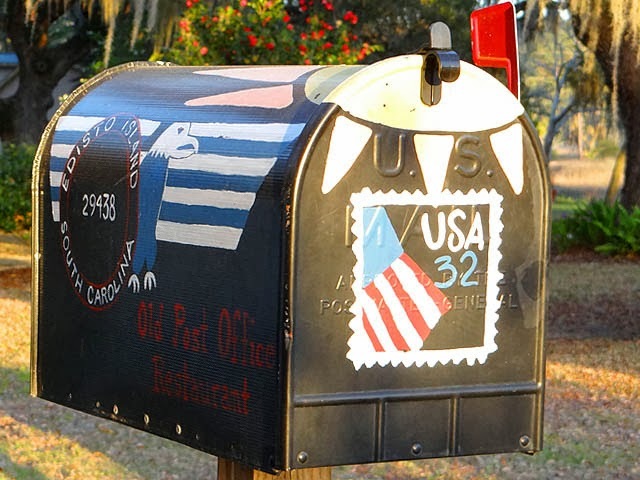 The mailbox is beautifully decorated with a stamp and giant Edisto Island postmark. The old postal window, just inside the entrance. The Morrises are impeccably friendly. The diners I witnessed while I was in town appeared to be enjoying their meals. With more post office buildings being either sold or shuttered, one can only hope that more owners will recognize and maintain the heritage of these sites, much as the Morrises have. 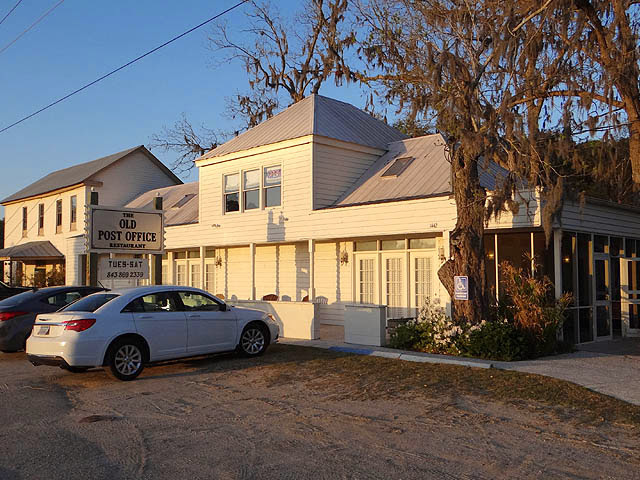 Other points of interest nearby include the With These Hands Gallery, which is right next door; and the Edisto Island Serpentarium, a few hundred feet down the road.